Reflecting on the Life and Legacy of Dr. Martin Luther King Jr. 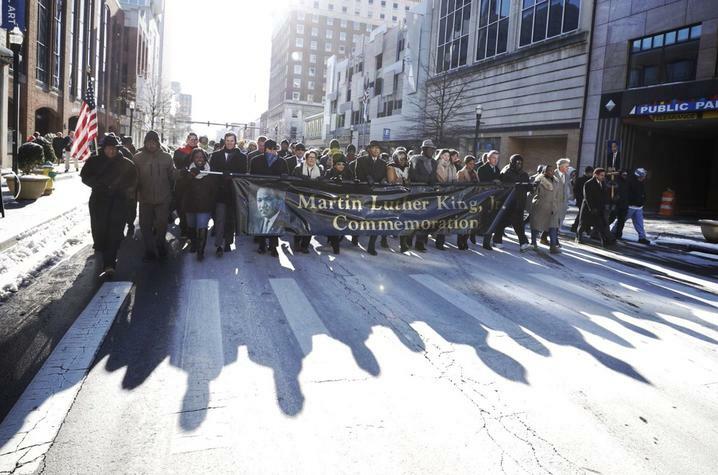 Earlier this week, members of the University of Kentucky and the Lexington community gathered in reverence and purpose, honoring the life of Dr. Martin Luther King Jr. The annual celebration and Freedom March progressed as opportunities to gather and affirm our commitment to the vision and values espoused by a man resolved to leave the world a better place. The event inspires me in different ways each year. This year in particular, I was struck by the parallels between Dr. King’s life—his peaceful, yet courageous determination—and the spirit we hope to harness and sustain at the University of Kentucky. We are a community driven and fulfilled by a distinctive character—a combination of unwavering determination and supportive, compassionate goodwill. We see this across our campus, from our impassioned efforts to enhance student success, to our research and health care enterprises squarely focused on Kentucky’s greatest challenges. We are a community that uplifts, heals, partners, and teaches. We are a community that cares. As I reflected on the day’s events, I was moved by the ways in which this character, this compassionate resolve, honors the spirit and the teachings of those who came before us—fathers and mothers, like Dr. King, who helped bend the arc of the moral universe toward justice. At the same time, we remind ourselves that we always have more work to do: more work to heal wounds, to recognize and address injustice, and to find ways to strengthen a sense of belonging across the UK family. Dr. King provides advice for these aspirations as well. University life offers an incredible opportunity to communicate with each other, and to build upon lessons of the past. Every time I walk through the Gatton Student Center, I am reminded of the beautiful, ineffable power we have to create a sense of place—a place to communicate—for those who learn, discover, work, and heal on this campus. It’s the power of places like the Martin Luther King Center, which harness our community’s distinctive character, that allows us to respectfully, but determinedly, build new bridges — ones that reconcile honest differences of thought, identity, perspective, and ideology. We will continue to support spaces where we come together to care for one another and to grow. We will look for ways to build upon this character that has both defined and strengthened our community for more than 150 years. And we will continue to look to those who came before us to ensure we honor their legacies and learn from their journeys. That is what it means to be part of this community. That is what it means to envision a better future for Kentucky.